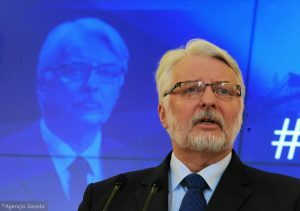 In December 2016 the Polish Minister of Foreign Affairs Witold Waszczykowski announced the decision to significantly cut the funding for Belsat TV channel broadcasting from Poland to Belarus and mostly funded from the Polish state budget. This decision immediately met a very negative reaction from the Belarusian civil society and media community. On 29 December 2016 the EaP CSF Belarusian National Platform adopted its Address to the Polish MFA bringing their attention to the negative consequences of such decision. The address was also supported by the EaP CSF Steering Committee. Furthermore, the Director of Belsat Agnieszka Romaszewska-Guzy raised this issue with the Polish Prime Minister Beata Szydło. Concerned about the situation, the EaP CSF Steering Committee (SC) organised a meeting with the Polish MFA representatives in Warsaw in cooperation with the EaP CSF Support Group in Poland on 17 February. The meeting was attended by the Deputy Minister, Undersecretary of State for Security, Eastern and European Policy Marek Ziółkowski and Deputy Director of the Department of Development Cooperation Marek Kuberski from the Polish MFA side, and Boris Navasardian and Ulad Vialichka from the Steering Committee side. The Steering Committee members raised the issue of the importance of Belsat TV as an institutional element contributing to the Belarusian civil society and media community. Support to the Belsat TV channel can be seen as a part of the Polish democracy support to Belarus, an effective tool in fighting Kremlin’s propaganda in Belarus and an essential element of the Polish security policy. The SC members also met with the members of the EaP CSF support group in Poland. The changes in the Polish foreign policy were discussed during the meeting with Katarzyna Pełczyńska-Nałęcz, former EaP CSF SC member (2009-2010), Ambassador of Poland in Russia (2014-2016) and currently head of Open Europe Programme at the Stefan Batory Foundation. Her analytical paper A Farewell to Giedroyc was instrumental in the process of planning the advocacy on the support of Belsat TV. The meeting with Krzysztof Bobiński from Unia & Polska Foundation, Łukasz Grajewski from Eastbook.eu, Łukasz Wenerski from Institute of Public Affairs and Krzysztof Mrozek from the Stefan Batory Foundation focused on coordinating the efforts around the Belsat issue and exchanging views on the state of affairs regarding the EaP agenda in Poland, as well as Polish interests in the policy towards specific countries in the region. The current situation and the negotiations with the MFA were discussed at the meeting with the members of the Belsat team – the Editor of News Programmes Siarhei Peliasa, Editor-in-Chief and Director of Belsat.eu online news resource Volha Shved and Chief of Programming Jaroslaw Kamienski. The Belsat team expressed their appreciation of the EaP CSF advocacy on the issue. During the event organized by Eastbook.eu the EaP CSF SC member Boris Navasardian presented the report on the propaganda challenges in the EaP countries, prepared within a project funded through the EaP CSF Re-granting Scheme. The EaP CSF plans to continue its advocacy efforts and organise meetings with various stakeholders, including representatives of the European institutions, Polish think tanks community and Polish government.